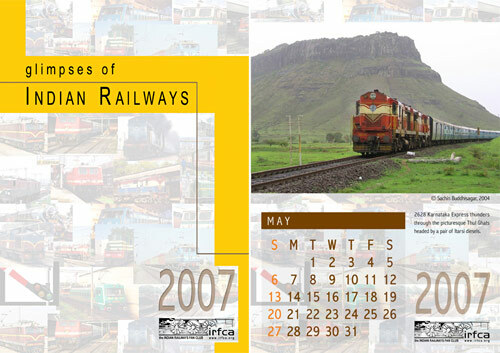 Yes, it’s the IRFCA calendar!! Thanks to Poochivenkat and all the people who sent in their photos, the calendar is finally ready. The printers will be churning out copies over the next week. Here’s a sample from one page. Looks good, doesn’t it! If you missed out on ordering it, don’t fret. We’ll take orders at the convention and deliver it sometime early February. Oh, the DVD looks great too (you will have to wait for the convention to see it!). Bharath, Saw the mail regarding transfer of T shirt charges to the calender and DVD a little late. I have already paid for 3 T shirts. As per your mail, will I get a copy of the calender and DVD, in spite of not having specially ordered for it? Balance from the payment already made may be given towards the server. Yes, doc. You will get one set (DVD+Calendar). Do let me know if you need more. I can duplicate the DVD’s easily, but I’ll need about a week for the calendar. The printing logistics is a nightmare! As I will not able to attend the Convention I would like to know how I can any papers that may be distributed at the Mas Convention. I am interested in the Calender as well. The Calender looks beautiful!!! And Sachin’s picture shown happens to be one of my personal favouriates! Dont mind if I can get a second copy (DVD + calender) too. I am interested in buying the calendar and DVD. I am located in Chennai. Please suggest me the needful. Keep the IRFCA Server going. Donate!